D.U.M.B. Dedicated. Up and Coming. Motivated. Bold We’re changing the age old saying that Millennials and Gen Z are lazy, entitled, etc. We interview the future of today’s society: influencers, entrepreneurs, artists and more. We connect people to people, stories to people and people to opportunity. As we grow, your voice grows too. Join us by hitting that subscribe button and showing the world that we are all Young and D.U.M.B. This week we host a T.A.L.K. show with Will Will is a nationally ranked tennis player and a master networker Learn how a 12 year old created a Youtube talk show talking to some of the biggest professional athletes The different perspectives of living CT, moving to LA, and now back in CT Being able to leverage those connections to talk with influencers from all industries If you want to get intouch with Will follow him on IG @weinbach and @willweinbach Follow us on Twitter, Instagram, and Facebook @Getchogrindup and check out our website www.getchogrindup.com! Always remember... We are all Young & D.U.M.B. and never forget... GETCHOGRINDUP! HIT THAT LIKE AND SUBSCRIBE BUTTON!!!! Thank you everyone! HAPPY NEW YEAR FROM THE YOUNG AND D.U.M.B. AND GETCHOGRINDUP SQUAD! In the spirit of Thanksgiving, we wanted to just give a quick thank you episode to all of you amazing listeners. We wanted to thank you for taking the time to listen to not only our story, but everyone that we have on too. If we've provided any sort of value please let us know and if you think of any guests we could have one, SEND US THEIR NAME TOO! Now go eat some turkey or whatever amazing food you will be enjoying today! Normal episodes resume next Tuesday! Happy Thanksgiving! This week we G.R.O.W. with Brett Brett is a 17 year old that runs a basketball Instagram account called @basketballstudios How he grew his first account to 6K followers but then got hacked Bouncing back from where it took him 2 years to get to 6K and with @basketballstudios to 44K in 2 years What his future plans are with school and life! If you wanna get in touch with them, the best place is on Instagram @basketballstudios or @bsbrett Follow us on Twitter, Instagram, and Facebook @Getchogrindup and check out our website www.getchogrindup.com! Always remember... We are all Young & D.U.M.B. and never forget... GETCHOGRINDUP! HIT THAT LIKE AND SUBSCRIBE BUTTON!!!! Thank you everyone! This Week We Curate Some A.R.T. with Anthony Anthony is a professional social media growth hacker He holds the usernames for 5 huge IG accounts @art_daily (1.1 Million Followers) @calories.hub (1 Million Followers) @artistic.globe (1.1 Million Followers) @livingdailyart (1.5 Million Followers) @restaurants (412K Followers) Got offered $150K for an IG account when he was just getting out of college and turned them down His experience with working with Gary Vaynerchuk If you want to talk to Anthony about anything, his IG is @_anthonysantiago Follow us on Twitter, Instagram, and Facebook @Getchogrindup and check out our website www.getchogrindup.com! Always remember... We are all Young & D.U.M.B. and never forget... GETCHOGRINDUP! HIT THAT LIKE AND SUBSCRIBE BUTTON!!!! This week we T.O.U.R. with Scott Scott is Jake Miller’s Manager Scott talks about how he got to become a recording artists manager The true knit and grit of the music industry What it was like to win Fear Factor! And we even get to hear some crazy tour bus stories! If you want to get intouch with Scott follow him on IG @scottnebb Follow us on Twitter, Instagram, and Facebook @Getchogrindup and check out our website www.getchogrindup.com! Always remember... We are all Young & D.U.M.B. and never forget... GETCHOGRINDUP! HIT THAT LIKE AND SUBSCRIBE BUTTON!!!! This week we learn to P.L.A.N.T. with Sarah Sarah is aspiring podcaster who JUST graduated high school She talks about her passion for politics and how that has helped her find her voice in the podcasting world How failure has helped her learn some of the most valuable lessons in life Getting Wettricked, you’ll just have to listen to the episode to find out what that means If you want to get intouch with Sarah follow her on IG @sarah.schaefer50 Follow us on Twitter, Instagram, and Facebook @Getchogrindup and check out our website www.getchogrindup.com! Always remember... We are all Young & D.U.M.B. and never forget... GETCHOGRINDUP! HIT THAT LIKE AND SUBSCRIBE BUTTON!!!! Thank you everyone! This week we throw a C.U.R.V.E. ball with Austin Austin is a professional Baseball player for the Minnesota Twins! We talk all things baseball, from little league to high school to college and what it took to reach the professional scene Austin has partnered up with Art (from our previous episode) as a sponsored athlete for Detatched Co We get to dive deep with our first professional athlete! If you want to talk to Austin about anything, his IG is @aschulfer Follow us on Twitter, Instagram, and Facebook @Getchogrindup and check out our website www.getchogrindup.com! Always remember... We are all Young & D.U.M.B. and never forget... GETCHOGRINDUP! HIT THAT LIKE AND SUBSCRIBE BUTTON!!!! Thank you everyone! This week we D.E.T.A.C.H. From The Norm with Art Art is a full-time criminal justice student as well as a full-time entrepreneur building up his clothing brand! Art had some swift success already, gaining over 1000 followers in his first month + signing a Professional Baseball Player sponsorship We talk about the schooling system and what could be changed for the better And his ups and downs. Why life… especially entrepreneurship is not all sunshine and rainbows! If you want to get intouch with Art follow his brand @detatched_co on IG Follow us on Twitter, Instagram, and Facebook @Getchogrindup and check out our website www.getchogrindup.com! Always remember... We are all Young & D.U.M.B. and never forget... GETCHOGRINDUP! HIT THAT LIKE AND SUBSCRIBE BUTTON!!!! Thank you everyone! This week we keep and O.P.E.N. Mind with Natalie Natalie has found a way to grow a huge following on LinkedIn You may think, LinkedIn and Followers? How does that work. Trust us, it does. Natalie has over 300,000 followers on LinkedIn, is going around speaking about the impact of LinkedIn, and has also won LinkedIn's Top Voice 2 times! She spoke to us about the importance of always keeping an open mind when speaking to others to learn about their cultures and mindsets As well as how students can leverage LinkedIn to gain internships + jobs If you want to get intouch with Natalie, her LinkedIn is “Natalie Riso” and her IG is Nat_Riso Follow us on Twitter, Instagram, and Facebook @Getchogrindup and check out our website www.getchogrindup.com! Always remember... We are all Young & D.U.M.B. and never forget... GETCHOGRINDUP! HIT THAT LIKE AND SUBSCRIBE BUTTON!!!! Thank you everyone! This week we eat C.H.U.N.K.Y. peanut butter with Adrian Adrian has one saying he loves to go by “Burn your boats” Imagine having 2 kids, a stable job, but not being satisfied with your life in terms of your work. What do you do? For Adrian, it was time for him to make a change. He moved from LA to NYC, leaving his kids with their mother to pursue his dreams of possibly working for Gary Vaynerchuk Now imagine eating dollar pizza and ramen just to get by for almost a year and having less than $50 in your bank account. And to top it all off, when your back was against the wall, you get job offers from Ryan Serhant AND Gary Vaynerchuk And the cherry on top is ironically, you deny the dream job you got offered! If you want to get intouch with Adrian, he's on all platforms @adrianvvlogs Follow us on Twitter, Instagram, and Facebook @Getchogrindup and check out our website www.getchogrindup.com! Always remember... We are all Young & D.U.M.B. and never forget... GETCHOGRINDUP! This week we learn about F.I.N.N. with Finn Finn has a story that may seem like its out of a movie He was an introvert in high school, only ever looking to watch Youtube and play videogames But he had an epiphany one day while on a walk where he literally decided to move to NYC knowing NO ONE He has now come to the US on two trips and has absolutely blossomed into a social media star, especially on LinkedIn If you want to get intouch with Finn you can reach him on all platforms @finnthormeier Follow us on Twitter, Instagram, and Facebook @Getchogrindup and check out our website www.getchogrindup.com! Always remember... We are all Young & D.U.M.B. and never forget... GETCHOGRINDUP! HIT THAT LIKE AND SUBSCRIBE BUTTON!!!! Thank you everyone! This week we H.A.U.L. with Sam Sam is a lifelong entrepreneur! He talks about how he has built Facebook pages to hundreds of thousands of likes and then selling them back in high school How he sees a similar pattern for LinkedIn and thats why he is going 100% into it How he started You Call We Haul If you want to get intouch with her, the best places are LinkedIn and Instagram @youcallwehaulpa Follow us on Twitter, Instagram, and Facebook @Getchogrindup and check out our website www.getchogrindup.com! Always remember... We are all Young & D.U.M.B. and never forget... GETCHOGRINDUP! HIT THAT LIKE AND SUBSCRIBE BUTTON!!!! Thank you everyone! This week we become M.E.N.T.O.R.Z. with Ava Ava is a 17 year old entrepreneur from Indiana She talks about the impact entrepreneurship has had on her life, how she got started in it because she never did entrepreneurial things growing up, and what the future lays ahead! She is currently killing it on LinkedIn and even has her own podcast out called MentorZ If you want to get intouch with her, the best places are LinkedIn and Twitter! @ava_wettrick Follow us on Twitter, Instagram, and Facebook @Getchogrindup and check out our website www.getchogrindup.com! This week we make a M.A.T.C.H. with Hannah Hannah has had an interesting journey in the writing industry She started off writing in an internship at Seventeen, Elle, and Cosmo. Then transitioned into a post grad role at Seventeen.com and eventually writing pieces for Washington Post and Buzzfeed, just name a couple She then took a career change into the matchmaking world. Now she has turned those matchmaking memories into a novel called “Playing with Matches” You can find her book at Amazon and Barnes and Nobles! Follow us on Twitter, Instagram, and Facebook @Getchogrindup and check out our website www.getchogrindup.com! This week we learn more about De La Creme with Branden and Kyle These boys are stirring up a storm with their fashion brand De La Creme They have been friends for almost as long as they can remember, growing up flipping sneakers and playing ball together, they always wanted to start a business together Through going to college in Boston and creating connections, they have been able to spread their brand across the North East through these connections They also talk through a recent business disagreement between themselves and a couple other partners and how they figured out how to navigate the whole situation! Follow their Instagram for their latest drops @delaacreme Follow us on Twitter, Instagram, and Facebook @Getchogrindup and check out our website www.getchogrindup.com! Always remember... We are all Young & D.U.M.B. and never forget... GETCHOGRINDUP! HIT THAT LIKE AND SUBSCRIBE BUTTON!!!! Thank you everyone! This week we learn how to use a B.A.T.O.N. with Jon Jon is an up and coming Orchestral Conductor Too many of us, this may seem like an odd job, but to Jon it has been a whole life in the making He talks about how he has been in the music scene since he was born The struggles of trying to pursue a profession that many do not recognize And overcoming the struggles of being a man of color in a profession where there are very little Check out his instagram @jonrushconductor Follow us on Twitter, Instagram, and Facebook @Getchogrindup and check out our website www.getchogrindup.com! Always remember... We are all Young & D.U.M.B. and never forget... GETCHOGRINDUP! HIT THAT LIKE AND SUBSCRIBE BUTTON!!!! Thank you everyone! This week we learn about A.V.N.I. with Eric Eric is a former professional skateboarder turned entrepreneur! He was one of the skateboarders who saw the talent in one of our former podcast interviews, Mikey Taylor His professional career has had his ups and downs, but in the end his is always back on his feet! Now he moves on to growing AVNI and his vision is to provide online learning to the masses Check out their Instagram @avni Follow us on Twitter, Instagram, and Facebook @Getchogrindup and check out our website www.getchogrindup.com! Always remember... We are all Young & D.U.M.B. and never forget... GETCHOGRINDUP! HIT THAT LIKE AND SUBSCRIBE BUTTON!!!! Thank you everyone! Gary Pershad is the co-host of the Young and D.U.M.B. show, but this week as a part of our Origin stories piece he is hopping onto the other side of the mic! We get to talk all parts of his journey including being a student athlete, transitioning into the adulting world, and of course his vision for Young and D.U.M.B. and GetChoGrindUp Let us know what you think about this episode by sending us a message on Instagram, Twitter, or Facebook @GetChoGrindUp and if you send us a screenshot of you listening to us, we can give you a shoutout on our IG page! This week we interviewed ourselves! Justin talks about the origin story of GetChoGrindUp and Young and D.U.M.B., how his motivation comes from his parents journey of escaping Vietnam, and answers his own deep thinking questions! Listen to hear about how without dolphins... he may not be here today! This week we learn to H.O.O.P. with Buster Buster is a 17 year old who is killing the basketball game He started Hoopsnation as he saw a gap in the fantasy basketball commentary scene and it has skyrocketed ever since Utilizing social media platforms like Facebook Live, Instagram, etc. he now has over 660K followers on Instagram He’s continued to leverage his following by being able to meet people such as the GM of the New York Yankees, Mike Rapaport, and Snoop Dogg just to name a few. At 17 years old, that's not too shabby. He just just graduated high school earlier this year! Check out his Instagram @bustascher and @hoopsnation Follow us on Twitter, Instagram, and Facebook @Getchogrindup and check out our website www.getchogrindup.com! Always remember... We are all Young & D.U.M.B. and never forget... GETCHOGRINDUP! HIT THAT LIKE AND SUBSCRIBE BUTTON!!!! Thank you everyone! This week we learn to S.C.R.A.T.C.H. with Sean Sean is living every sneaker heads dream. He got gigs at some of the biggest shoe retailers and got to see shoes 1-2 years before they were released. He started his DJ business by becoming a sneakerhead From waiting in lines at shoe stores, to connecting with store manager, to hosting shoe release parties, to DJing at Allen Iverson’s jersey retirement party He’s traveled the world working at these shoe companies and has now moved back to his hometown of Philadelphia Check out his Instagram @itsseanmc If you might want to book him, send an email @itsseanmc@icloud.com Follow us on Twitter, Instagram, and Facebook @Getchogrindup and check out our website www.getchogrindup.com! Always remember... We are all Young & D.U.M.B. and never forget... GETCHOGRINDUP! HIT THAT LIKE AND SUBSCRIBE BUTTON!!!! Thank you everyone! This week we learn to do D.O.P.E. sh*t with Ben Ben started his own podcast called “Do Dope Sh*t” with the mission similar to ours of sharing stories of our generation. He's releasing episodes every week alternating between interviews and solo podcast episodes He talks about what it takes to start and grow a podcast He talks about his journey of why he wanted to start the podcast Check out his Instagram @benjaminhaydenleavitt Check out his podcast at “Do Dope Sh*t” Follow us on Twitter, Instagram, and Facebook @Getchogrindup and check out our website www.getchogrindup.com! Always remember... We are all Young & D.U.M.B. and never forget... GETCHOGRINDUP! HIT THAT LIKE AND SUBSCRIBE BUTTON!!!! Thank you everyone! This week we learn to S.T.R.U.M. with Brandon D’Eon Brandon is your classic “starving artist”. He went to school to get a degree in Jazz Music, but he’s found a way to make it work for himself! He's put in numerous hours of research on Youtube to perfect the Instagram algorithm He has over 28K followers on Instagram, but what is incredible is how he is able to get hundreds of thousands of views on his videos! He’s looking to turn this following into something greater and showcase his true personality! Check out his Instagram @brandondeonmusic Follow us on Twitter, Instagram, and Facebook @Getchogrindup and check out our website www.getchogrindup.com! Always remember... We are all Young & D.U.M.B. and never forget... GETCHOGRINDUP! HIT THAT LIKE AND SUBSCRIBE BUTTON!!!! Thank you everyone! This week we learn about Austin Ermes Austin’s life took a quick turn when he made one decision… instead of just talking to this CEO over the phone, let me see if it was okay to fly out and have an in person talk with him! Austin took that risk, spent his own money on the flight and got to meet Alex Maclean (CEO of East Coast Lifestyle) This showed his commitment and love for the clothing brand, Alex actually offered him a job once he graduated! Now working as the multimedia coordinator and video editor for the NELK Boys, hes had numerous adventures and lives a life he never could have dreamed of! Check out his Instagram @austinermes Follow us on Twitter, Instagram, and Facebook @Getchogrindup and check out our website www.getchogrindup.com! Always remember... We are all Young & D.U.M.B. and never forget... GETCHOGRINDUP! HIT THAT LIKE AND SUBSCRIBE BUTTON!!!! Thank you everyone! This week we learn about Nadeem Nadeem is an up and coming Youtuber who started off in pranks and is now moving into producing his own skits! He’s been able to gather hundreds of thousands of views on his videos, even though just getting into the game! We got to talk to Nadeem about: What inspires him when creating new content How you need a solid support group around you to achieve anything Going through struggles in life and how to come out victorious at the end Check out his Instagram @nuh.deem Subscribe to his Youtube channel ScraapyTube Follow us on Twitter, Instagram, and Facebook @Getchogrindup and check out our website www.getchogrindup.com! Always remember... We are all Young & D.U.M.B. and never forget... GETCHOGRINDUP! HIT THAT LIKE AND SUBSCRIBE BUTTON!!!! Thank you everyone! This week we learn about Mikey Bee Mikey is the teacher most of us would have loved to have had in our middle school days. Mikey is constantly trying to find ways to keep his students engaged through his rapping, mindset mondays, along with a slew of other tactics! We got to talk to Mikey about: What are the roots behind his rapping game. How he actually got into teaching. What the future of education may look like! Check out his Instagram for his educational raps @Mikeybee3 Follow us on Twitter, Instagram, and Facebook @Getchogrindup and check out our website www.getchogrindup.com! Always remember... We are all Young & D.U.M.B. and never forget... GETCHOGRINDUP! HIT THAT LIKE AND SUBSCRIBE BUTTON!!!! Thank you everyone! A little update on how everything has been going with the podcast and movement! Thank you to everyone who has given us a listen! Young and D.U.M.B is a podcast for the dedicated, up and coming, motivated and bold. It's for dreamers and innovators alike who want to make the world theirs. Our goal is to connect people to stories, people to people and people to opportunity. It's ordinary people like you and us who are capable of incredible things that are gonna change the world. Listen to the Young and D.U.M.B podcast to hear individuals who are well on their way. This week we take it to the N.E.X.T. level with Tom, David, and Pat! These three are all brothers! And on top of that they are starting their own business together called Next Level Stick They have found a way to add essential oils into an inhaler! They have 2 inhalers currently, Sunrise and Sunset Sunrise - to help with your mood throughout the day Sunset - to help you rest as you go to sleep These brothers are a great bunch together and the future is bright for them! Follow them on Instagram: @nextlevelstick Check out their website: nextlevelstick. This week we talk to Kyle Mogged aka The Zen Wizard. He shares us stories about how he was able to become self aware and how that has effected his life in a positive way. We also learn about his business called the Zentality School; where he teaches about mindful meditation and living a healthy life. Recently Kyle completed an internship with VaynerMedia and accepted a full time offer to move from Florida to New York! His journey has been full of ups and downs but he has always shown positive energy to the people around him! Lets learn how to maintain one's self with The Zen Wizard! Thank you everyone for listening; if you liked this podcast, don't forget to subscribe eave a comment or review! And look on getchogrindup.com to find Kyle's D.U.M.B. profile! It is Episode 6 of the Young & D.U.M.B. Podcast and this week we interview Phil Dobson from the beautiful country of Jamaica! Phil talks about the differences of growing up in Jamaica vs what he has seen in his summers up in the United States of America as well as the challenges that he faces in applying what he learns in school to the fast pace culture of the US. Phil offers a unique perspective of a country that a lot of Americans reference with the Rasta culture and speaks to how a lot of stereotypes that Americans associate with Jamaica tend to have some truth to them. Join us as we take a P.H.O.T.O. with Phil in his Jamaican perspective! This week on Episode 5 of the Young & D.U.M.B. podcast, we speak to Suhayb Zarroug, an aspiring entrepreneur who has had his hand in many different fields already in his young career. Adventurous. Dapper. Assertive. Perceptive. Tenacious. Are 5 key words we used to describe Suhayb, listen to find out why. Whether it is buying and flipping art as an art broker, hosting high class events, or even creating and selling bomber jackets for extreme premiums; Suhayb has definitely had some big successes early on but he certainly is not done yet! Join us on this journey as we learn how to A.D.A.P.T. with Suhaybe! 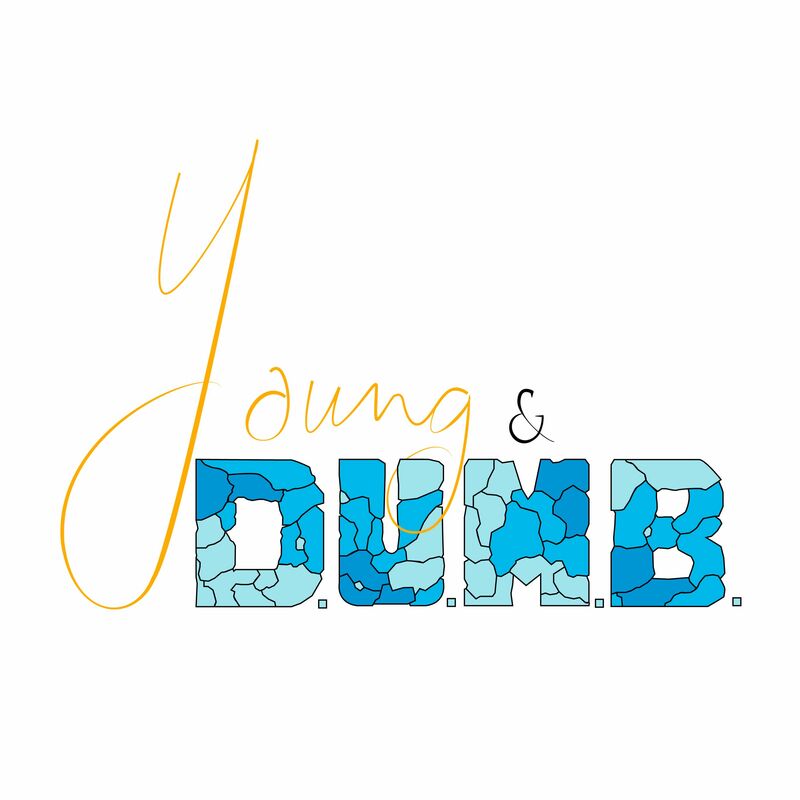 Welcome to Episode 4 of Young & D.U.M.B. this week we have Brendan Cutuli who is a man who has fought mental illness his whole life. Learn more about how being M.E.N.T.A.L. has effected him in both positive and negative ways; all the while he is still succeeding in the world. Brendan's story is both unique and heartwarming as he sheds light on a topic that usually gets swept under the rug. Wheres your head at? Lets take a look in the M.E.N.T.A.L. P.A.R.I.S. Today we talk to Pedro who is a former High School football player who had to just pass 2 college courses to play college football but could never do it. We learn about how he then found out that schoool probably was not for him and went into modeling. Pedro has had several huge accomplishments from modeling to Givenchy and FILA, as well as being flown to P.A.R.I.S. Thank you for listening and Welcome to Paris everyone! This podcast is to incapsulate Justin Levy's aka DJ Dollaz journey on becoming the #1 high school DJ in the Greater Hartford Area by the age of 17. Levy has lived his life on being H.Y.P.E. which stands for Hair, Yonder, Passion, and Eclectic. Through the podcast you will hear about the astonishing accomplishments by Dollaz and learn how he got to where he is today of being booked every weekend for the whole summer before the summer even started! This is an interview for the Young and D.U.M.B. Podcast which is with your hosts Justin Nguyen and Gary Pershad, with our special guest Bilal Afolabi. We hear about Bilal's inspirational story about coming from a little African country called Togo to Hartford, Connecticut in the United States of America. Join us on our journey to give the youth a voice in this enormous world!